As part of our celebration of LGBT History Month throughout the month of February, let’s take a look at the life and career of tennis great Martina Navratilova. Born in Prague, Navratilova first picked up a tennis racket when she was four years old, and by seven she was playing competitively. She came from a sport family — her grandmother had represented Czechoslovakia at tennis, and her parents were both ski instructors. At the age of 15, Navratilova won the Czechoslovakia national tennis championship. In 1973, aged 16, she made her debut on the United States Lawn Tennis Association professional tour but did not turn professional until 1975. Navratilova won her first professional singles title in Orlando, Florida in 1974, at the age of 17. By 1978, she had won her first major title — Wimbledon. By the time that Navratilova retired from competitive tennis, in 2006, she had won 167 top-level singles titles and 177 doubles titles. She dominated tennis for decades. In 1975, Navratilova went to the offices of the Immigration and Naturalization Service in New York City and informed them that she wished to defect from Communist Czechoslovakia. Within a month, she received a green card and in 1981 became a US citizen. Navratilova was 18 years old. 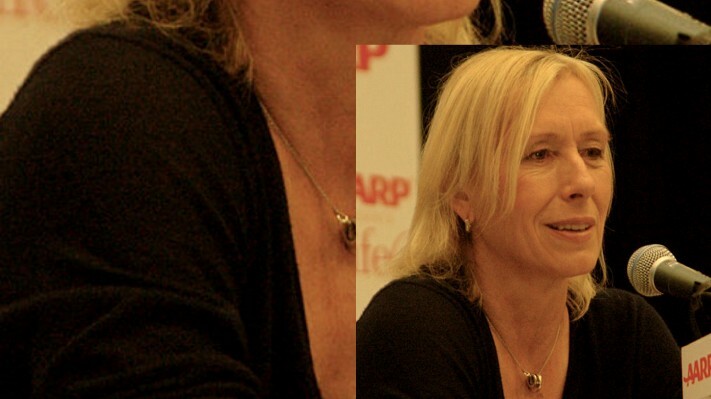 Navratilova first publicly discussed her sexuality in 1981. Navratilova is married to Julia Lemigova. They were married in 2014. An outspoken advocate of the LGBTQ community, Navratilova has been at the forefront of queer issues across the decades. Navratilova was inducted into the International Tennis Hall of Fame in 2000.